Do you think it is coincidence that the God of Moses mentions Egypt immediately before delivering Commandment 1 Thou shalt have no other gods before me? I think there is very much purpose in calling out Egypt before Commandment 1. I have mentioned this before. It is a focal point for demonstrating why Christianity and the Thelema do not and will never mix. It seems to be the responsibility of the Egyptian God King to establish the laws of the afterlife. We will examine this shortly. Now Egyptian God Set (brother of King Osiris) arrives late to the coronation. A short aside. In this serendipitous moment I realize the plot of the Gods of Egypt is nearly identical to the Disney film The Lion King of all things. If you have ever seen The Lion King then you know Simba is presented on Pride Rock by King Mufasa when he is born. Scar is envious of the ceremony so he does not attend. Set is envious of the Horus coronation so he disrupts the Horus coronation ceremony. Scar kills Mufasa. Set kills Osiris. Osiris teaches Horus and the crowd the law of the afterlife. Mufasa does the same when he teaches Simba about the Circle of Life. Set becomes King. Scar becomes king. Simba will have to fight his evil uncle. Horus will have to do the same. Set rips out the eyes of Horus. Scar has a scar over his left eye. I see striking similarities. Maybe I should analyze The Lion King some day! In the Thelema religion there was once the Aeon of Isis. Isis isn’t a big deal in the Gods of Egypt movie. Her Aeon has essentially passed. The Aeon of Isis was an age to worship the mother goddess in ancient times. It would be defined roughly as civilization before 2000 BC. Therefore it included the astrological Age of Taurus (astrological bull). Following in progression is the Aeon of Osiris. The Aeon of Osiris ushers in the concept of the “Dying God” religions according to the Thelema. 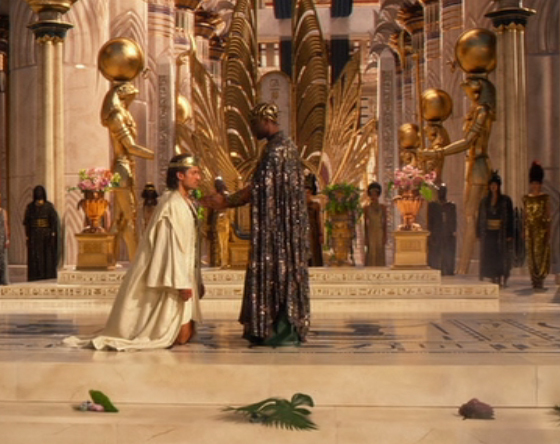 In the movie Osiris himself is killed by Set in grandiose fashion (dying god). Set also kills Mnevis whom is an Egyptian Bull God (Age of Taurus). Christianity is considered “dying god worship” by the Thelema religion. And so Christianity is assigned to the Aeon of Osiris by Aleister Crowley whom established the Thelema. Mind you Judaism does not worship a dying god. Also the God of Noah / Abraham / Moses never will die. But the Thelema religion does not care about this. They only care about any technique that can boost their magick power in rituals. Essentially by tapping into these broad concepts of the Aeons the Thelemites believe that their magick powers are boosted. That is the purpose of all of this Aeon belief structure. It is to conduct more potent magick. Now you know. We continue. Remember when Set crashes the Horus coronation party in the movie? He presents Horus with a gift of a horn of a dead ram. This is a reference to the astrological age of the Age of Aries (astrological ram) which came after the Age of Taurus but before the Age of Pisces (astrological fish). The presentation of a dead ram horn symbolizes the Age of Aries is dead. It symbolizes the God of Moses is dead (but as Christians this is a ridiculous lie). You can see why the God of Moses doesn’t appreciate the Thelema religion or the Egyptian Gods. Not one bit. 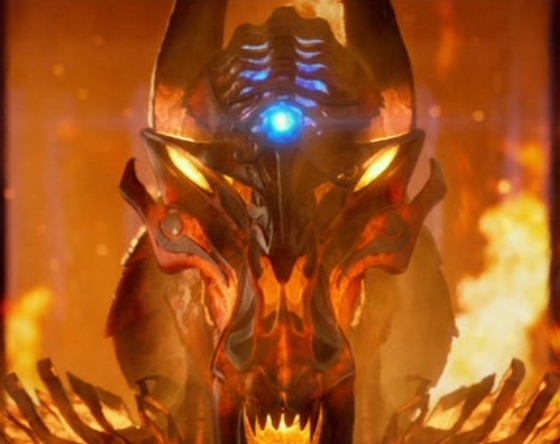 Recall now Set kills Osiris and names himself King and defines laws of the afterlife. This represents the ushering in of the “unofficial” Aeon of Set (unofficial to Aleister Crowley). Notice there is never a ceremony for Set to be crowned King. Nor does he ever put on the crown. He is King but it is “unofficial”. I probably should have mentioned earlier that aeons can and do overlap. The rules of the Thelema aeons are not set in stone. They are vague concepts to unify and enhance magick. Enough of Set though. Traditional Thelema treasures the Aeon of Horus over the Aeon of Set. And that is exactly what this movie does. Horus is the hero of the Liber Al Vel Legis which is the Book of the Law which is essentially the Thelema religion’s bible. Yet another Thelema parallel as Horus is the hero in the Gods of Egypt movie. Horus kills Set in the film. The “Temple of Set” explodes and is destroyed. This is one thing that surprises me about the Thelema religion. I am surprised Aleister Crowley wasn’t a bigger Aeon of Set fan which truly seems more evil than Horus. Maybe he knew Set would never gain the mass appeal that Horus would. Maybe he truly worships Set but you don’t find that out until you reach a certain degree in the mystery religions. There must be some reason. I am not sure why. (Horus) Do you think I am ready? (Thoth) Hmmm. True readiness is a notoriously difficult state to achieve. But – you are close enough. Of which the Horus afterlife speech sounds pretty appealing. Which I believe is the end game. The end game is to sell Horus as a hero and a reasonable god to normal movie goers. In turn it promotes the Thelema religion to the masses. III,51: With my Hawk’s head I peck at the eyes of Jesus as he hangs upon the cross. III,53: With my claws I tear out the flesh of the Indian and the Buddhist, Mongol and Din. In closing I would just like to say the following. The Egyptian Gods directly oppose Christ and the God of Noah / Abraham / Moses and the King James Bible. The aeons are for boosting magick (forbidden in the Bible). The Thelema religion is about worshiping Egyptian Gods. Know these things.